The theme song for the 1960s Spider-Man cartoon boasts the following lyrics: "Spider-Man, Spider-Man, Does whatever a spider can Spins a web, any size, Catches thieves just like flies Look Out! Here comes the Spider-Man." The aforementioned lyrics essentially sum up the core of Spider-Man and distill them down to a few catchy words that don't fully convey the experience of swinging through New York City and fighting crime. 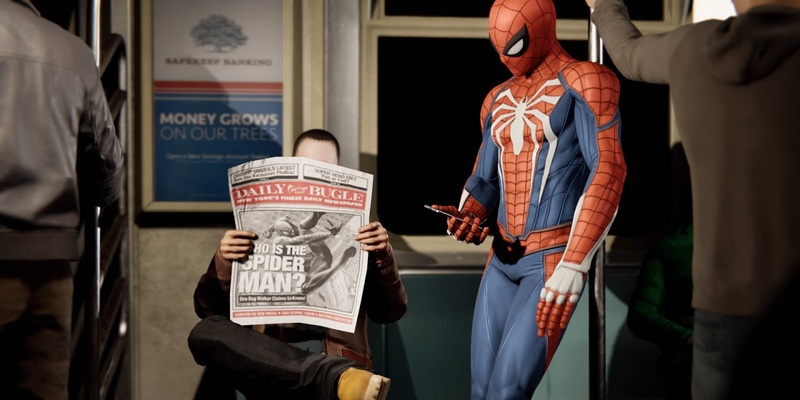 It hasn't been until Insomniac Games's Spider-Man that people can truly understand everything that Spider-Man can do. The game is set in modern-day New York City. Norman Osborn is mayor, Peter Parker is working as a research assistant with Otto Octavius and Mary Jane is a photojournalist. Parker has a relatively cozy relationship with the NYPD and the core of the story focuses on him going up a new gang called the Demons. As the narrative unfolds, players are given a glimpse into Parker's world and all the ups and downs that come with it. The story plays out like an entry in the MCU (or maybe a Netflix series) and manages to work in a good chunk of the Spider-Man mythos, some of which is digging deeper than others for sure. From the outset, the player is immediately given relatively free-reign throughout an approximation of New York City. The environment certainly isn't a one-for-one recreation of the Big Apple, but there's enough landmarks present to make it feel like an accurate portrayal. Landmarks such as the Empire State Building, Madison Square Garden and the Queensboro Bridge all make appearances to ground the city in reality. There are also some Marvel locations peppered throughout as well; there's nothing quite as thrilling as scaling Avengers Tower and plummeting off the side before swinging out at the last second. And that's the core of being Spider-Man that Insomniac Games does so well. Swinging throughout the city is made relatively easy and happens primarily through the use of R2. This allows the player to shoot and swing; holding it for longer will hold onto the thrown web longer to create a higher arc. Short presses and holds will create a faster traveling experience which is great for chasing down getaway cars careening through the city. Holding L2 will slow time a bit for the player to find a grapple point from which R2 will shoot a web for the player to catapult themselves forward. There's also some parkour involved that seamlessly blends together the swinging and hurdling AC units on rooftops. Being Spider-Man is a true blast and the city seems so much smaller because of how easily it is to traverse it. Sprinkled throughout the city are a variety of side-assignments that give the game an open-world mentality. Crimes pop-up after descrambling police towers, landmarks can be photographed, pigeons can be chased and Black Cat stakeout points provide clues to another mission. There's a staggering amount of things to do in the city that are brilliant in their ability to capture various aspects of Spider-Man's personality. More and more sidequests unlock as the main narrative progresses which is an interesting way to keep interest in the city fluid. The reward for completing many of the missions is upgrades which is where the science part of Spider-Man comes into play. Spider-Man has an array of suits at his disposal, some of which just look fun and some of which bring with them additional powers. Those powers are unlocked and can be assigned regardless of whether the suit with the power is equipped which is a nice touch. There are also gadgets that can be purchased with tokens received from the aforementioned missions that unlock better web shooters, modified web shooters and things to help in combat like a Spider Drone. And playing various aspects of the game offer XP which levels Spidey up and allows players to select skills from three different trees: Innovator, Defender and Webslinger. Each tree affects various aspects of the gameplay and it's a good idea to spend some time adapting them to your gameplay style. While the web-slinging is fun, combat is equally as enjoyable. Insomniac Games has created a system that many have compared to the combat in the Rocksteady Studios Batman games in terms of its free-flowing sensibilities. Spider-Man and Batman are two very different characters so it's refreshing how Insomniac Games managed to work in various aspects of Spider-Man and Peter Parker into the combat. The Square button handles the bulk of the work and triggers just about all the melee attacks. There are options for the player to work in the web gadgets and web in general, providing a combat that rather seamlessly pull together everything to make combat feel like a breeze. It's definitely easier to string everything together than it was in the Arkham series. The game looks gorgeous and sounds even better. This is by far one of the best-looking games that you can get and the PS4 Pro as it rather meticulously details the nuances of New York City. Swinging through the city feels real, thanks to how quickly the city is rendered and the fact that you can even look inside some buildings. The landmarks that are recognizable are easily so and even Times Square feels like an accurate representation of its real-world counterpart. There are times when you're just sitting on a rooftop and you can hear a steam vent or water dripping, providing a nice audio touch to an already bustling city. There is one minor complaint about the audio and that's the sweeping orchestral hero music that ramps every time you swing--it would be nice to be able to swing sometime without hearing the music. Spider-Man is an absolutely fantastic game that truly gets what it means to be Spider-Man/Peter Parker. The character is one of the most enduring characters in all of comics and he finally has a game that delves into his universe with aplomb. Swinging is a breeze, combat is enjoyable and the story isn't bad. It remains to be seen how much further Insomniac Games will explore the universe, but there's plenty of rocks left unturned that they definitely have the leeway to do so. Spider-Man is available for PS4 and PS4 Pro September 7.